Welcome to another Critter Blog Challenge! 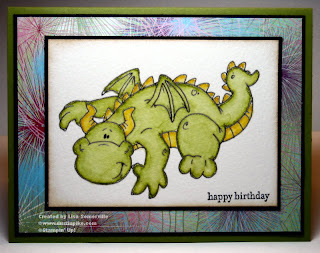 This weeks theme is to create a "critter" themed Birthday card. The designers are all using images from this months Sponsor - Dustin Pike on their creations. So grab some stamps and play along at the Critter Blog, at the end of the month a lucky winner will be winning their choice of 3 digital images from Dustin's store. I used one of Dustin's cute Dragon images to create my birthday card. Wouldn't it make a cute kid's card! I printed the Dragon image on Watercolor Paper, then Clear Embossed. To add color, I used the Marker Water Coloring Technique, then sponged the edges with Creamy Caramel ink, and added the sentiment in Black. Looking for more inspiration, using Dustin's images, head over to the Critter Blog to see what the other Designers created this week. Lisa I love your creation this week. Thank you so much for another fabulous DT week. Cure card! I like the watercolor paper. Love your DP paper and your image is colored to perfection! Great job! Adodrable dragon! Your coloring is fab! Adorable card! Great coloring on the dragon! The background looks fantastic. So cute! I love that little dragon-just darling! beautiful coloring, the dragon looks great up against that paper!